Regular participation in physical activity (PA) has many physiological and psychological benefits, whether undertaken as part of a professionally prescribed exercise program or a leisure pursuit. PA includes structured aerobic and resistance exercise, competitive and recreational sport, occupational activity, as well as activities of daily living. Increasing one’s level of PA is gaining wide recognition as one of the essential elements of behavioral change necessary to promote overall health-fitness. From young to old, from those with chronic illnesses to elite athletes, regular PA can play an important role in optimizing performance and enhancing functional capacity, even preventing and treating a wide variety of diseases and disorders. 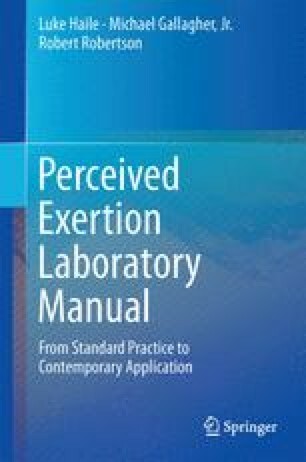 This laboratory manual presents data based on experiments that are intended to provide advanced understanding of those perceptual and psychosocial factors that influence promotion, adoption, and maintenance of PA of the type that provides positive health-fitness benefits. Allender S, Scarborough P, Peto V, Rayner M, Leal J, Luengo-Fernandez R, Gray A (2008) European cardiovascular disease statistics: 2008 edition. European Heart Network, Brussels, Belgium www.ehnheart.org. Accessed 28 Mar 2014. Centers for Disease Control and Prevention (2014) Behavioral risk factor surveillance system, Prevalence and trends data. http://apps.nccd.cdc.gov/brfss/. Accessed 28 Mar 2014. Exercise is Medicine (2014) About exercise is medicine. http://www.exerciseismedicine.org/about.htm. Accessed 3 July 2014. United States Department of Health and Human Services (2005) Dietary guidelines for Americans. http://www.health.gov/dietaryguidelines/dga2005/document/. Accessed 31 Mar 2014. World Health Organization (2014) Physical inactivity: a global public health problem. http://www.who.int/dietphysicalactivity/factsheet_inactivity/en/. Accessed 28 Mar 2014.